Thanks to its curved shape, the outdoor lounger ensures excellent comfort and complete relaxation in the garden or on the balcony - whether to sunbath or read your favourite novel. Available in various materials and colours, the comfortable garden sunbeds decoratively enhance your outdoor area and make the summer perfect. Learn more about design loungers here and find the model that suits you and your home. Whether in the balcony, in the garden, on the beach or at the Spa - loungers transform all outdoor areas into an oasis of relaxation and provide that special holiday feeling in the blink of an eye. With their s-shaped designs, the garden loungers provide your body with an all-round comfortable lying position, in which you can switch off from everyday stress and enjoy the summer to the fullest. Find out everything you need to know about the comfortable garden furniture and how to find your ideal outdoor lounger, here. Balcony: Do you live in an apartment in the city and only have a small balcony? That's not a problem! With the help of a flexible lounger, a foldable balcony table, some planting pots and atmospheric outdoor lighting, you can transform the smallest outdoor area into a relaxation zone and leave the hustle and bustle of the city behind. Thanks to the practical reclining function, you can relax on your lounger to drink a cup of coffee, read a book or just lie back and enjoy the sun. 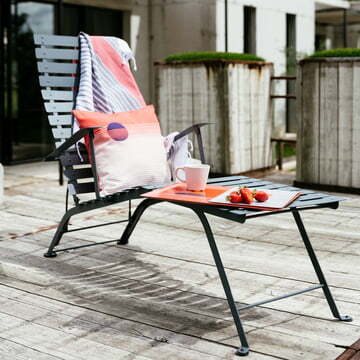 Terrace: For the terrace, a foldable lounger made of lightweight material is best. This lets you effortlessly move your lounger to follow the position of the sun. If you want to have a barbecue in the evening with friends and family, the lounger can quickly be folded up and swapped for the garden furniture set: chairs and a table complete with a parasol. Garden: If you have a large garden, there are many different possibilities when it comes to sun loungers. For example, there are big double loungers for two people that often come with a built-in sunshade. Combined with a side table, a garden bench and a swing, you can create a stylish seating area in the garden that invites you to relax with friends. Travelling: Whether at the lake, in the park or at the swimming pool - enjoy maximum comfort wherever you are. 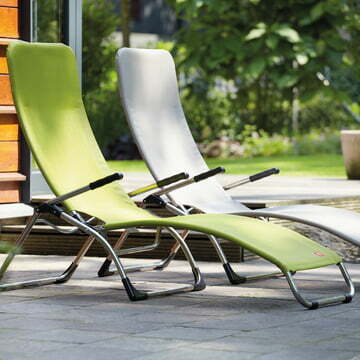 Narrow, lightweight and foldable outdoor loungers without armrests are easiest to transport. With the models that have special wheels, it is even simpler. So make yourself comfortable and put your feet up at that picnic or open-air cinema. Many designers use powder-coated aluminium for the loungers' frame – a material that is renown for its light weight and weather resistance. 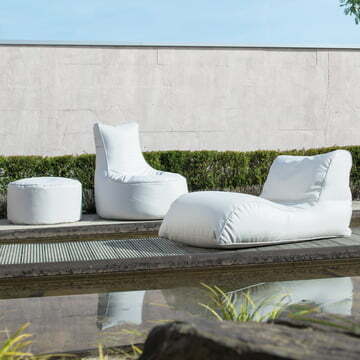 A comfortable textile cover made of a weather-resistant, air-permeable plastic fabric is just as characteristic for a design lounger, ensuring a very high comfort, even without cushions. Models made of steel or wood are heavier and more stable, but usually require more care and additional padding to relax comfortably. A lounger is usually characterised by its curved shape that promises a pleasant sitting position. They adapt to the body and thus relieve the back and the spine. The leg rest allows you to put your feet up and let your entire body decompress. After a long day sitting at a desk, the garden lounger together with fresh air and some sun does miracles. Thanks to the integrated reclining function, you can gently lean back to find the ideal position. Lie back and take in the sun, read a good book or sit up to drink your coffee. The Movida aluminium lounger by Fiam can be adjusted continuously, making it the ideal sun lounger, but also a practical garden chair. Loungers with a lightweight, foldable aluminum frame are extremely flexible and can be quickly converted from a garden lounger to a beach chair. Being easy to store, they will fit on even the smallest of balconies and terraces. For many loungers a sunshade is also available, protecting you from the strong midday sunrays or providing you with enough shade to read, just like a little roof. If the fabric cover is not yet soft enough, or if you opt for a stable wooden or steel lounger, you can increase the comfort with special seat padding, such as the Fat cushions by Fiam, or an extra head cushion. A design lounger can provide much more than perfect relaxation in the outdoor area. With its characteristic curved shape and colourful fabric, it becomes an elegant and decorative element for the garden in no time. The Amida Aluminium Sunbed by Fiam is available in a variety of colours, from black to white to turquoise, and can be perfectly matched to your other garden furniture. 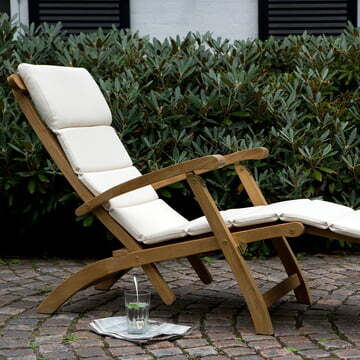 A garden lounger out of wood is both rustic and elegant. The high quality material is particularly resistant and provides a warm atmosphere and typical nordic charm. With vivid cushions, you can easily introduce colourful accents that make sitting and lying even more enjoyable. If your existing garden furniture is also made of wood, be sure that the wood of your lounger matches that of your garden furniture. The Bistro deckchairs by Fermob are made of steel and offer typical comfort and relaxation with their arched slats and adjustable backrest. In bright shades of green and red, they act as colourful eye-catcher in your garden, radiating positive energy and a feeling of summer even when it is raining or cloudy. A lounger for the terrace and balcony can be purchased from 150 euros. 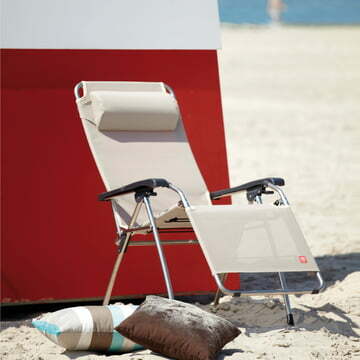 The lightweight and flexible aluminium sunbeds by Fiam lie in the medium price range, between 170 and 200 euros. Particularly robust and exclusive models, such as the Steamer lounger by Skagerak, made of steel and wood, can be found in the higher price category. No matter which model you choose, every design lounger will offer you excellent comfort in the outdoor area - lie down, sit back, relax. Do you want to buy a design lounger online, but need some help? Feel free to contact our customer service team at any time. We are happy to help and give advice, make recommendations and resolve any issues quickly and efficiently. Have your favorite items delivered straight to your door.